To Make Rangoes Take cowcumbers when thay'd full grown, cut out a bitt at the thin end & scope out all the seeds, then put into em a good deal of mustard seed some [green?] pepper Jamaca peper a little ginger & a blade of mace & a clove of garlick, for the pickle you must boile some old stale strong bear & vineger not violent [sharp?] & poure in on boiling hott. 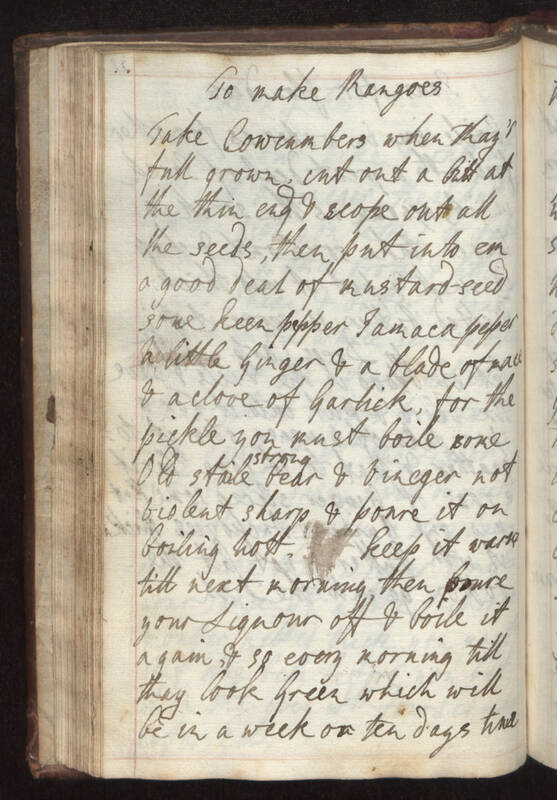 Kepp it warm till next morning then poure your liquour off & boil it again, & so every morning till they look green which will be in a week or ten days time.